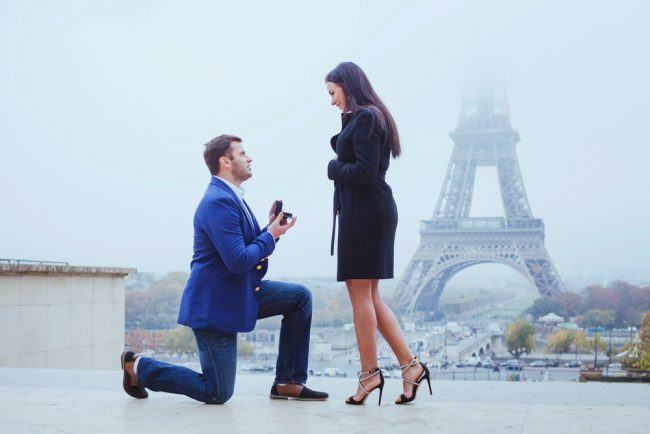 The question has finally been popped, and you and your longtime sweetheart are finally engaged! It’s time to celebrate your new engagement with a photo shoot so you can make the announcement official for friends and family. What better way to capture this moment of your life and share your story to the people you care about? But like most things bridal, picking the right setting or photographer might be overwhelming. Follow these tips to plan the perfect engagement photo shoot! Do you prefer casual, formal, or candid photos? Some couples never look natural in a pose, so plan for a shoot that reflects your personality. If you are silly, be silly. If you are a couple that loves the outdoors, pick a location that is outside. Maybe you have a little money to spend and you want to splurge on a professional photographer. The good news is that most photographers include an engagement photo session as part of their overall wedding package, so be sure to do a little digging and you might find a package deal. This is the best time to see your photographer in action! You can also experiment with flattering poses, angles, and lighting levels before your wedding day. You don’t need to have matching outfits, but there are some guidelines for dressing the part. For men, choose a solid color and stay away from patterns, plaids, and florals. If you are conservative, pick a neutral color that coordinates color tones you both like. For women, keep the jewelry simple to avoid distractions in your photos. The best photos always have an element of comfort: no purse, no keys, no phone. Leave those at home! Or at least leave them in the car. A great photo shoot largely depends on the location you choose. Consider fields, beaches, lakes, farms, city center, the park, river falls, and other backdrops. The more variety, the better! Take advantage of the season to add life to your images. Red and orange trees could make your autumn photos look heavenly. Rapeseed fields and daffodils show off the spring season. What about a photo shoot skiing or throwing snowballs in the winter? Sometimes a candid pose is more flattering than any planned pose. Talk to your photographer about different activities he can photograph you doing as a couple. For example, rather than pose in front of a lake, rent a rowboat and take it out while the photographer snaps pictures from the shore. Other ideas that show off a great location with an intimate activity include picking strawberries, a nature hike, or a picnic on the beach. For couples that spend more time indoors than outdoors, you can do a night in–with wine tasting, marshmallow roasting, and cuddling up to a movie. You want to look your best at the photo shoot, right? Once you have the photographer, the location, and the perfect outfit, you need to think about your hair and makeup. Like a photographer, you can try out a new makeup artist for the engagement shoot as an “audition” for your wedding day. Pro tip: Do not overdo your makeup; always try to look as natural as possible! As for the hair, think of styles that match your background. For example, if you were taking a photo shoot outdoors, loose hair, ponytail, plaiting or other more feminine hairstyle would look perfect for the lady. You’re a great looking couple, the lighting is perfect, and your photographer is a pro. Don’t forget to show off that engagement ring! Ask your photographer to take detail photos of the ring to share with loved ones who may not see it until the wedding day. You could hold hands, have matching coffee cups, or reenact your engagement by putting the ring on as if it were the first time. Most photographers these days use digital media and deliver photos in a digital format. Our final tip, once you have your photos, is to back them up! Don’t just save them in one place. In fact, back them up in two or three places where you save images. This way, you can always be sure that you’ll have access to those cherished memories, even if you get a new computer or phone or your favorite photo sharing site ceases to exist in the future. Whether preparing an engagement photo shoot to complement your Save-The-Dates or to decorate your home, you always want the best pictures possible. Engagement photos are unique to every couple and cherished for a lifetime. Spend the time you need to make sure every detail is perfect!